I have been working on some fun Spring projects around here – and I can’t wait to show you the first one today! 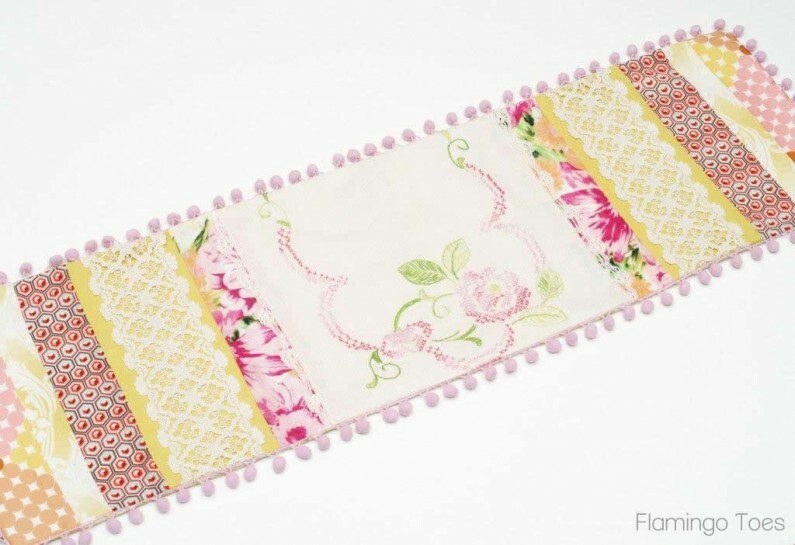 I love using Vintage Linens in fun new ways – and this repurposed embroidered linen piece is perfect in my new Spring Table Runner! This little runner looks so perfect on my entry way table. 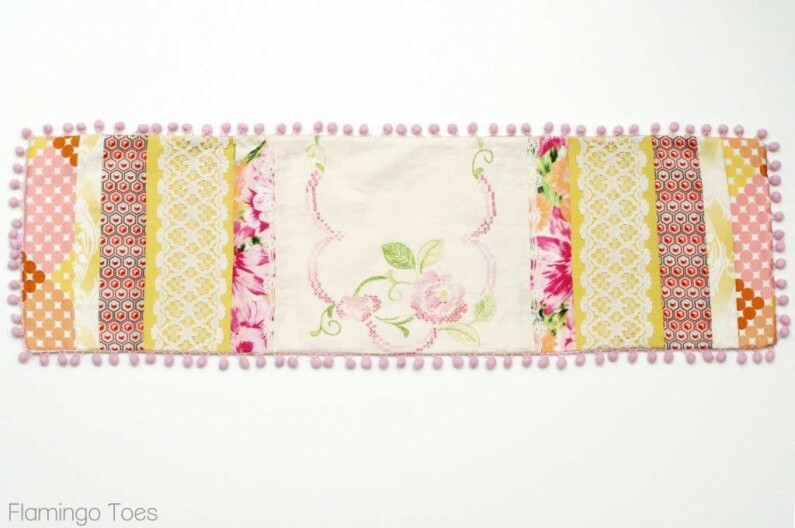 I pulled in the pretty, spring colors in the vintage piece and chose fabrics that would be bright and cheery! The center is a gorgeous embroidered piece of linen I picked up at an antique store. It had some stains and holes in the center of the runner, so I thought I’d give it a fresh start. I love the pom pom edging too! This is super easy to do too! 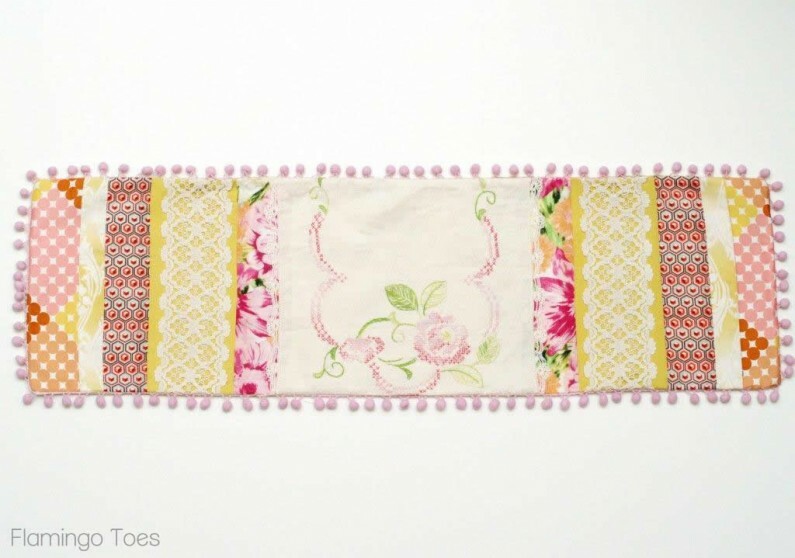 I’m going to give your fabric pieces/measurements for this runner – it is sized 35″ x 10″ (not including pom poms). If you want a different size, or have a different sized vintage piece, you’ll have to adjust your measurements. The Vintage Runner was 11″ wide. I used the full width and cut it to 11″ tall. 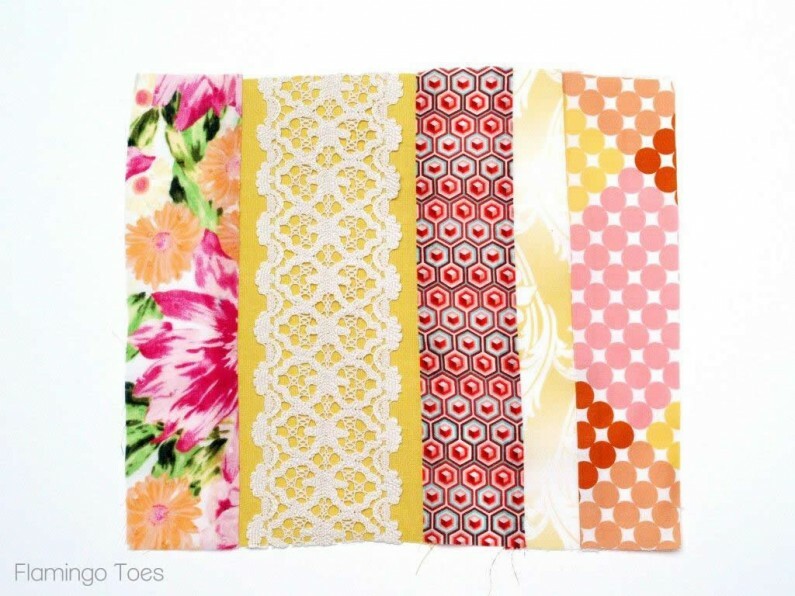 Begin by deciding what order you’d like your fabrics to be in, then cut out your pieces. 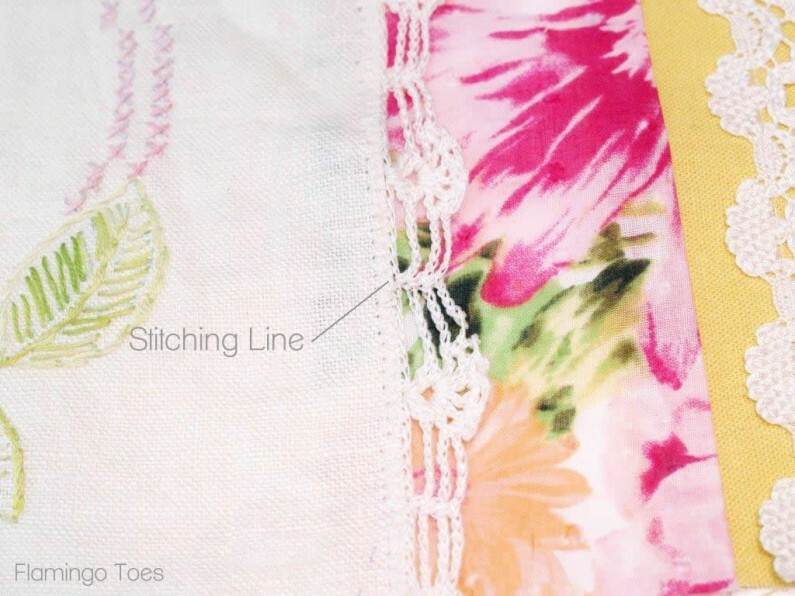 On each side of the vintage center, the fabric pieces go in this order: 3″, 5″, 3″, 2″, 3″. 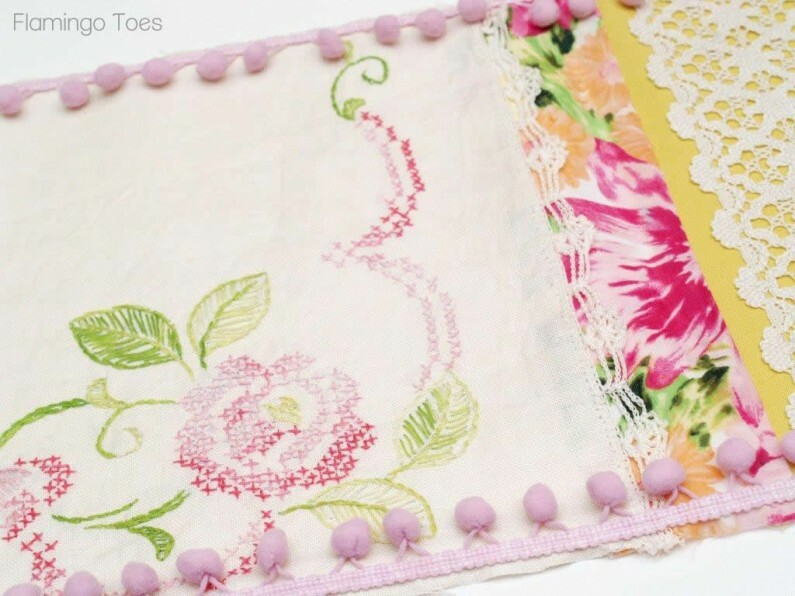 Sew the vintage lace on your large 5″ piece first. I just sewed a straight stitch on either side of the lace. Sew each side of the runner together with 1/2″ seam allowances. Press the seams to one side. 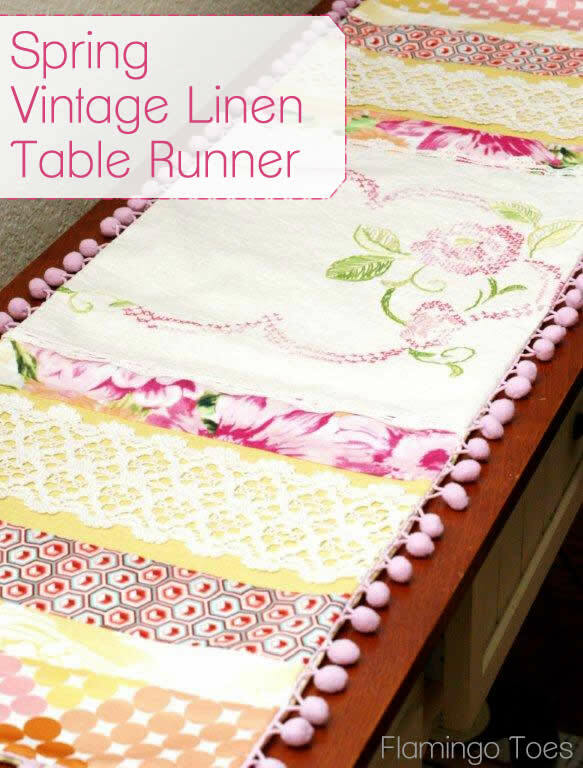 Since my vintage runner had lace on either side that was in good shape, I wanted that to show. 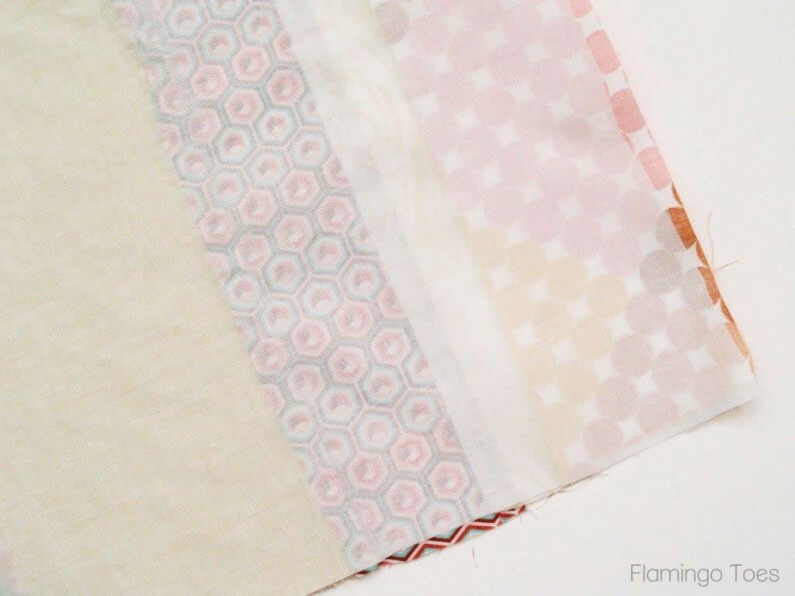 If you have the same, just overlap the runner 1/2″ on top of the inside fabric piece and sew down. If you don’t have lace to show off, just do a regular seam with your vintage piece. Repeat with the other side of the runner. 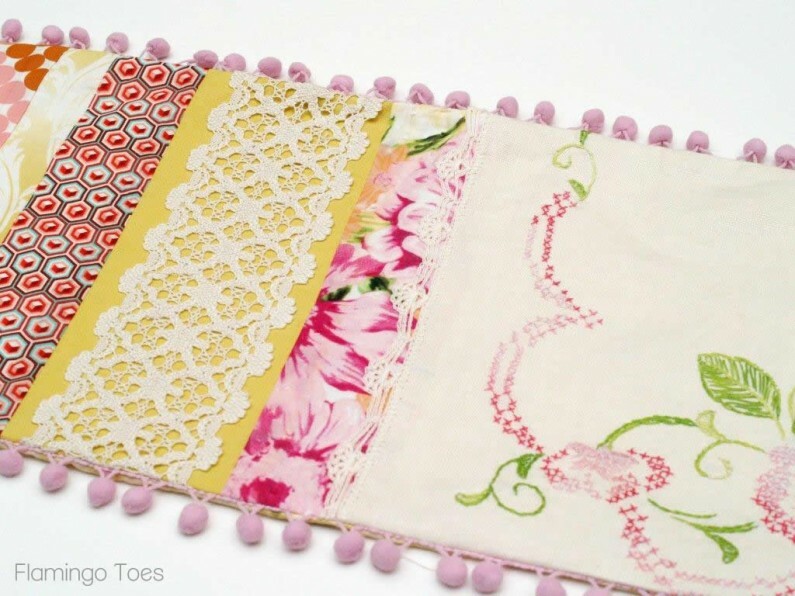 Iron your woven fusible interfacing to the back side of your pieced runner. 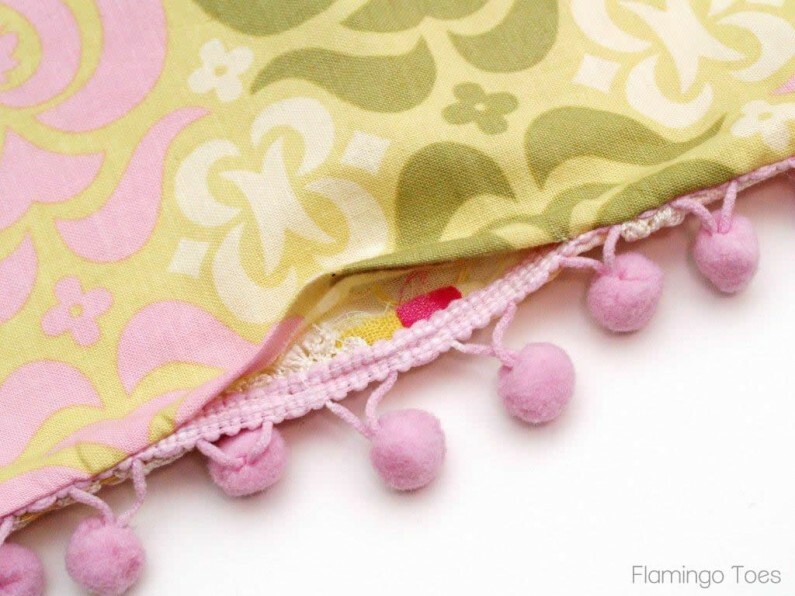 Sew your pom pom trim just inside the right side edges of the runner. Overlap the ends. The pom poms should point in towards the center. Pin your backing and runner top together, right sides facing. Sew around all four edges, leaving about a 5″ opening for turning. Clip your corners and turn the runner right side out. Press the runner. « Making Fabric Flowers and a Giveaway! This is beautiful and would also be a way for me to incorporate so many of the fabric scraps I have into a worthwhile item. 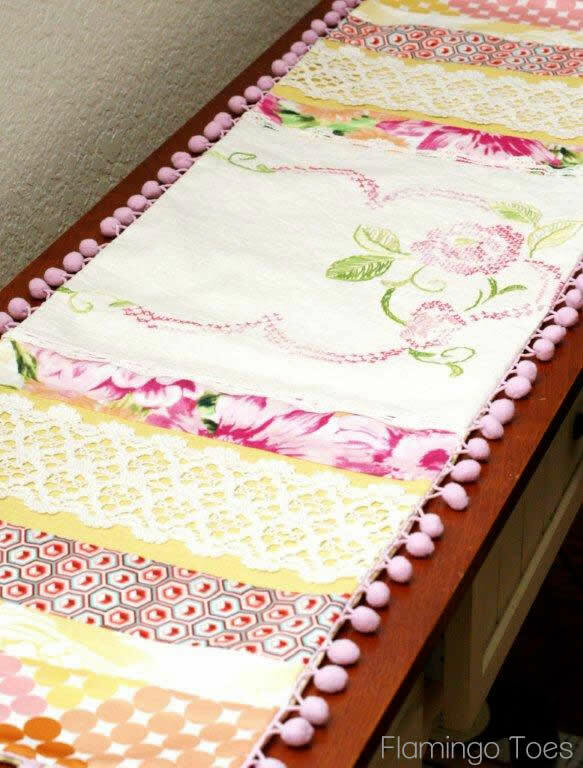 I have spied vintage doilies and linens @ thrift stores but couldn’t think of what I wanted to do with them. Now I know. If I make one it will be used a dresser scarf. 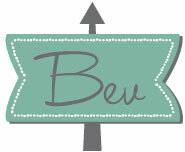 Super cute, Bev! And I love the bright colors. That embroidered piece is GAWgeous! This is absolutely beautiful! You have inspired me! I have quite a few beautiful runners and table covers with embrodery that I haven’t used in years. They are just sitting in a drawer…but I think this may be the perfect solution and tribute to my Oma. Thank you!!! This is just lovely Bev! The colors of the fabrics are the perfect compliment to the gorgeous embroidery! Really nice! Love the colors, the pom pom and the whole vintage feel to it! I use alot of vintage linens in pillows and runners and love the look. Yours turned out beautifully. Love the ball fringe! 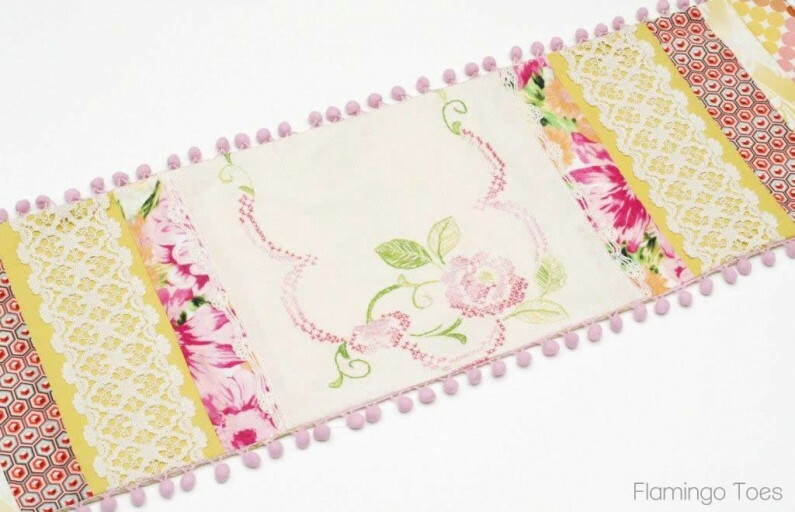 this table runner is so pretty Bev, I love it! So beautifu, Bevl! Love the pom pom all arround. Thanks so much for sharing the great tutorial! Oh Bev, this is just gorgeous! The colors are so pretty and perfect for spring! Thank you for the tutorial! So cute!!! I have one similar to this I got at target a couple years ago, but it’s too summery for now. I’ve been meaning to make one. Love these colors and the pom trim! this is gorgeous, bev. so beautiful. this is a fabulous idea. So super pretty!! The pom poms are perfection!!! Yay spring!! Oh, you must be reading my mind! This is exactly what I have been wanting. I machine embroidered 2 towels for my guest bathroom and liked them so much I did another one on linen to use in the bathroom. I wanted a nice topped for the toilet tank but just could not decide how to get it together. This will be perfect, not vintage, but just right for me. I will send you a pic when I get it done! This runner is awesome!! I love the pom poms, I’ve been looking for an excuse to stock up on some, and I’m preeeetty sure this will be it. 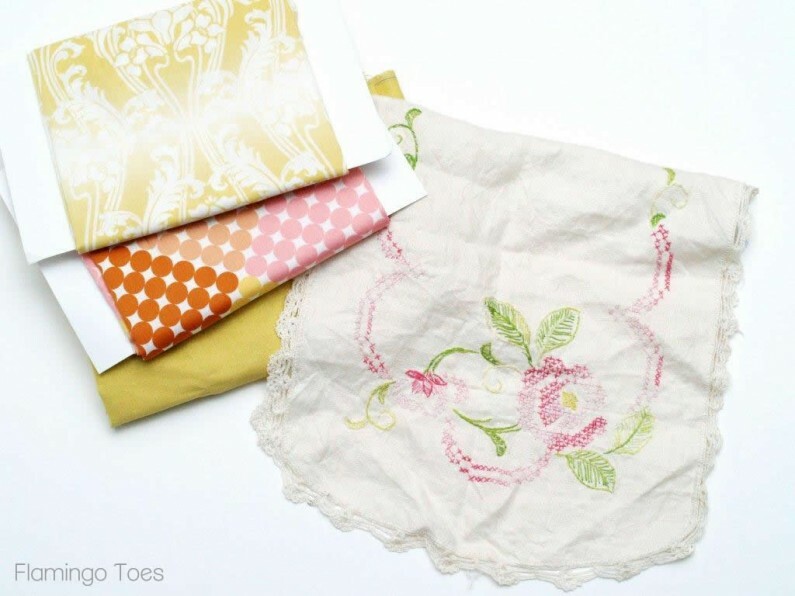 The linens are adorable, and perfect for spring! Great job; thanks for sharing your work!! popping in & following from Sew Much Ado link party! Oh my – steal my beating heart. I definitely need this! The colors you selected are very Springy!! I love your tutorial especially because your pictures are so crisp and clean. We are starting a link up party on Thursdays (today:), and we would love for you to join us with this post and/or any others you would like to include. We are at allthingswithpurpose.com. Hope to see you there!! What a fun idea! I have a few vintage napkins that my Grandma hand-embroidered. This idea would give them fresh life. I could not be more in love with this! So adorable! I love the pom pom edge – so cute! Thanks for the tutorial! This is so lovely! What a great idea – thanks for sharing!! So pretty, what a wonderful idea. So nice to use those beautiful hand embroidered pieces. You gave it new life! I love this. I have an embroidered table runner that belonged to my husbands grandmother. It is somewhat tattered in area and this will be a great way to make it into something we can display on our dining table! Great idea! thanks for sharing!! I have vintage embroidered scarves that belonged to my Mom & Aunt. Now I know just what to do with them. Thanx for the great idea!! Also have vintage hankies that would work. Love ur site! What an interesting and resourceful use of a vintage piece! Love, love, love it!!!! This is wonderful. I’m going to look to see what I have of my Grandma’s that I could turn into a runner, I know I have some tatting that she did that I could add, as it doesn’t take a lot. What a great idea for the vintage piece. I am an avid estate sale goer and next time I see a piece like this I definitely am going to make one of these! It’s very pretty. I’m not a pom pom person, so I would use some flat lace! What a clever use of embroidery in this piece! It’s just as cute as a button. I’m subscribing to your blog to see your other work. Thanks for sharing! This is a beautiful way to display older pieces of linen! It could also be done asymetrically, or with the end pieces as 1/2 circles, giving an oval finish. Beautifully done. Thank you so much for the awesome idea. I have some worn out ones that my made and can’t part with them. Now I don’t have too. 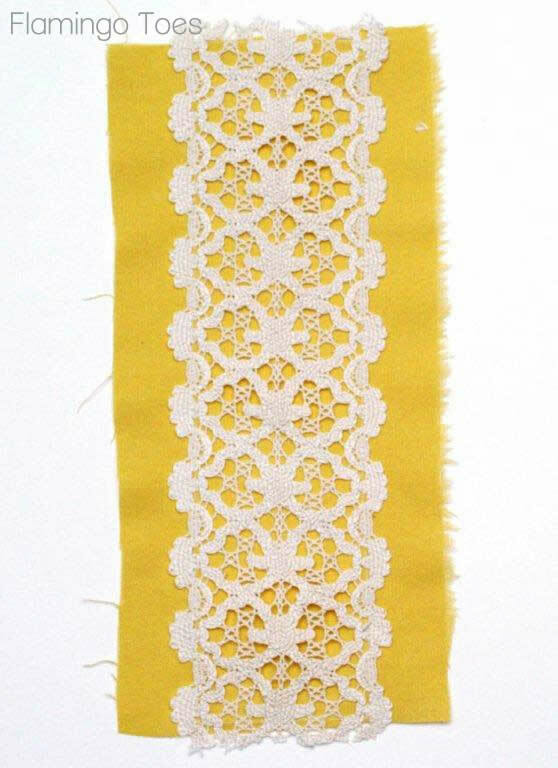 Any idea for lacy handkerchiefs? Hi Laura! I’m so glad you like the idea! I love it! I have signed up for e-mail. I am there! What a super idea. I love old linens but after they’re stained & holey, afraid to use them. but you have repurposed them. thanks! Just signed up for more of your good ideas too. Love this! 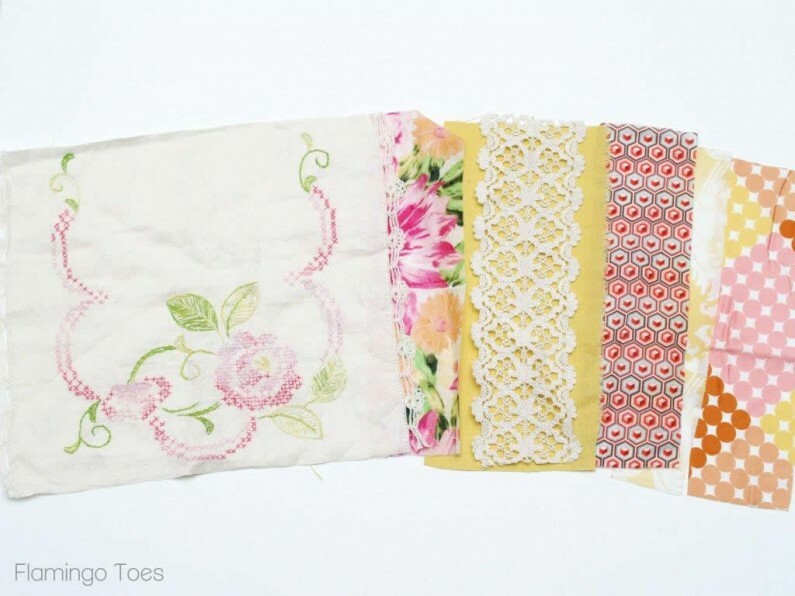 I’m collecting vintage handkerchiefs w the intention of creating a runner. This helps & I LOVE the Pom Pom detail. I found this post through Jacquelyne Steeves email newsletter today. It could not have come at a more perfect time. I just moved my 88 year old mother into assisted living. She has some old linens her mother embroidered and some from when she was young. I wanted to try to use my grandmother’s in a way that each of my female cousins would get to use some part too. This is the perfect thing to do. I am so excited. Thank you so much for the great idea! I’m following your blog! Thank you so much for sharing this! I have been looking for a project with my odds and ends. This is gorgeous! Looks great! Nowhere if only I had one to use.